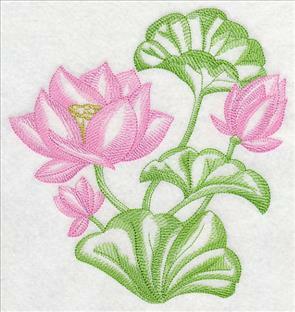 Bring the beauty of Asian culture to your embroidery with these new designs! 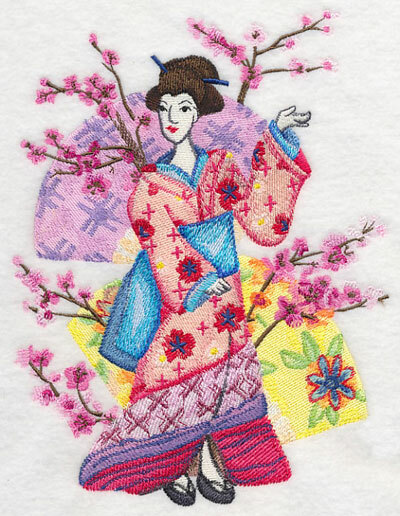 Bright colors, watercolor-inspired stitches, and classic motifs are the perfect way to stitch your next Asian-theme project. Adorable Asian watercolor friends, Japanese garden panel scenes, new motifs featuring cherry blossoms and bamboo, plus so much more await in this collection of new designs! Scroll down the page to check out these Asian-inspired designs! 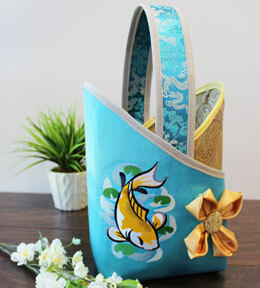 A gorgeous satin purse gets a stunning update thanks to this koi fish design. Learn how to make the handbag here. 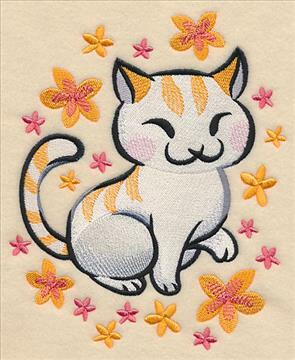 Sweet, watercolor animals amp up the cute factor when stitching Asian-theme designs. Each of the charming critters feature similar brushstroke-like lines and colorful accents, such as the lily pads and leaves in the designs below. 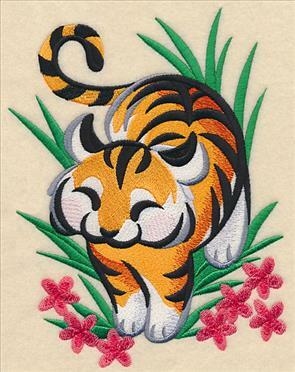 Both panda bears and tigers are well-known symbols of Asian culture: The panda represents the idea of slowing down, being carefree, and bringing abundance and prosperity, while the tiger is known for its ferocity, beauty, and the drive to achieve progress. Stitch these watercolor versions of the cultural animals on your next project. Each of the cheerful watercolor friends are perfect for adorning kids decor, stitching on tote bags, or embellishing a pillow or quilt. Stitch your favorite solo, or try them all on one large project. 5.86" x 7.28" and 4.86" x 6.04" and 3.11" x 3.84"
An airborne dragon is the perfect way to finish off this collection of too-cute critters. 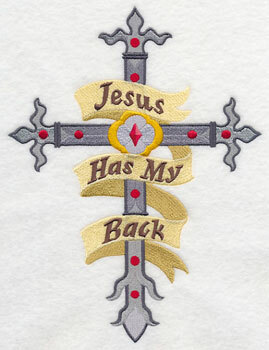 Stitch him on wall hangings, towels, blankets, aprons, and more! 5.86" x 7.62" and 4.86" x 6.32" and 2.98" x 3.87"
These fun watercolor friends are great for adding Asian flair to any of your embroidery projects. Choose your favorite by clicking the links above, or get all seven in a design pack. Capture the beauty of a traditional Japanese garden with a series of panel designs. Each panel features a classic aspect of the rich Asian culture, including bamboo shoots, lotus flowers, cranes, temples, koi fish, Mt. Fuji, and more. 3.87" x 11.73" and 3.10" x 9.40"
3.85" x 11.73" and 3.09" x 9.40"
2.57" x 7.82" and 2.27" x 6.86"
These panel designs are fabulous when stitched alone, but they truly shine when they're all used on one project. The various panels created one entire garden scene when lined up together. 3.84" x 11.73" and 3.08" x 9.41"
3.88" x 11.73" and 3.11" x 9.40"
2.59" x 7.82" and 2.28" x 6.86"
Below we show the panels stitched in a series of framed pieces perfect for adorning an accent wall. 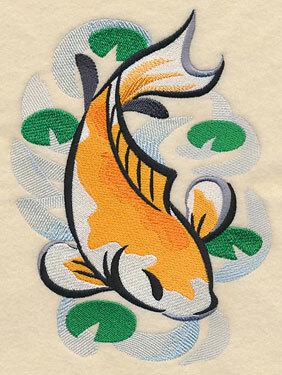 You'll find even more project ideas for embroidering panel designs right here! Get all four of the Japanese garden panel designs in a design pack! Geisha, directly meaning "art" and "person," is defined as a traditional Japanese entertainer known for her skill in classical music, dance, games, and conversation. Geisha have long been a well-recognized aspect of Japanese culture, and this design reflects their beauty and grace. 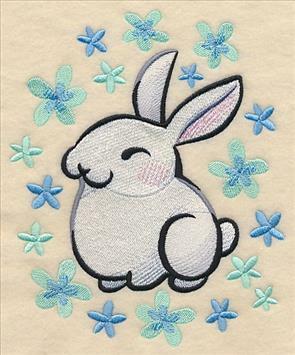 Stitch it on pillows, tote bags, and more! 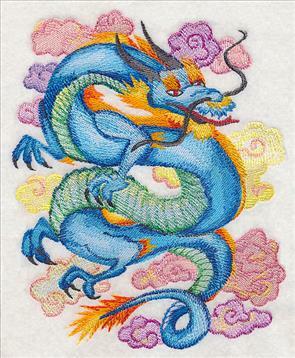 6.91" x 9.08" and 5.86" x 7.71" and 4.86" x 6.39"
Pretty watercolor-inspired stitching and vivid colors give this ferocious dragon a beautiful and eye-catching appeal. Dragons are legendary creatures in Asian mythology and symbolize power, strength, and good luck. 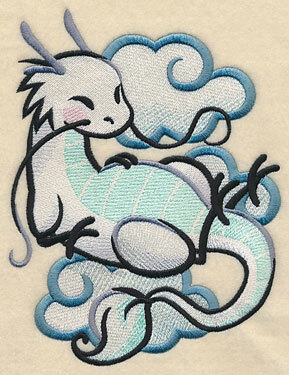 Stitch the striking dragon design on your next embroidery project! 6.88" x 8.55" and 5.84" x 7.26" and 4.85" x 6.03"
Traditional Asian motifs get a light and lovely makeover with these airy toile designs. Toile is known for its light stitches and open areas that allow the fabric to show through, which means they're best on smooth, neutral fabrics. Try on quilter's cotton, linen, tea towels, and more! 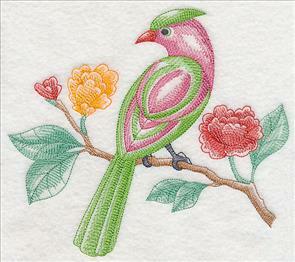 6.90" x 9.14" and 5.85" x 7.75"
7.42" x 7.80" and 6.75" x 7.09"
5.85" x 6.15" and 4.85" x 5.09"
Stitch a toile bird perching on his favorite blooming branch -- they're great on canvas tote bags, pillows, and tea towels! Or, add them to a placemat to bring bright color to your kitchen table. 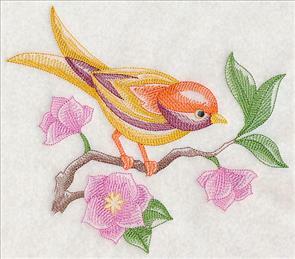 7.80" x 6.88" and 6.64" x 5.86"
7.80" x 6.88" and 6.63" x 5.85"
5.49" x 4.84" and 3.85" x 3.40"
Delightful toile birds are a great way to add summery flair to your embroidery projects. 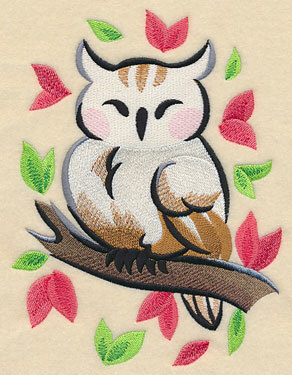 Use all three of the birds together, or pick your favorite to stitch. 7.80" x 6.90" and 6.62" x 5.86" and 5.50" x 4.86" and 3.85" x 3.40"
Cherry blossoms are beautiful pink-hued blooms found in Japan and are featured prominently in their everyday culture. The flower is richly symbolic, and has been often used in Japanese art, manga, anime, and film, as well as tattoos, and in musical performances for ambient effect. 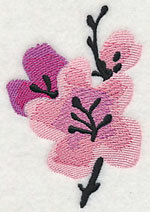 Stitch a cherry blossom tree on tote bags, pillows, and wall hangings to show off the beautiful bloom. 6.04" x 11.74" and 4.83" x 9.39" and 4.00" x 7.80" and 3.53" x 6.85"
Cherry blossoms are known to symbolize clouds due to the effect their blooms take when flowering in a group, and are also a common metaphor for the short-lived nature of life, or circle of life. This stems from the fact that the blossoms wither quickly despite their full-bodied beauty. 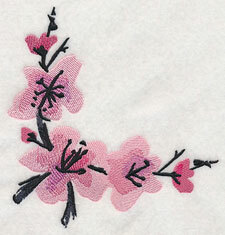 11.75" x 4.13" and 9.41" x 3.30" and 7.80" x 2.74" and 6.83" x 2.41"
A cherry blossom border is a fabulous way to stitch the bloom on table and bed linens, apparel, and many other embroidery projects. The flower is traditionally represented on a wide variety of consumer goods in Japan, such as kimonos, paper goods, apparel, and linens -- make your own version of these products! 11.75" x 2.30" and 9.40" x 1.86" and 7.79" x 1.53" and 6.00" x 1.41"
Finish your collection of the floral motifs with a spray, a corner, and a design featuring cherry blossoms in bloom. 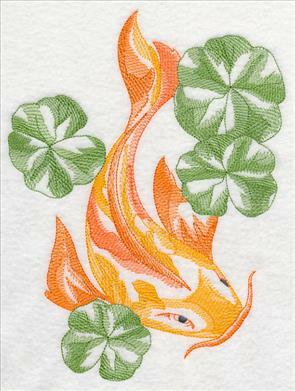 Use the designs to embellish a quilt, update a jacket, or adorn your table linens. 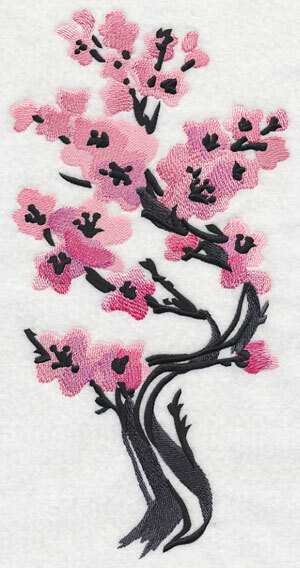 3.72" x 11.72" and 2.97" x 9.40"
5.85" x 6.19" and 4.85" x 5.11"
Pick your favorite cherry blossom design to stitch a lovely bloom on your next project, or get all the designs together in a pack. 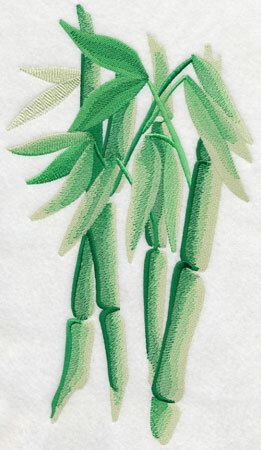 Bamboo plants are known for having a long life, being strong with a hollow core, and persevering under harsh conditions. 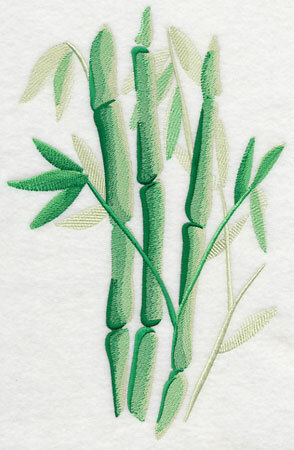 Because of its unique qualities, bamboo has a strong importance in Asian cultures. 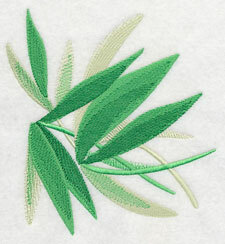 These light and lovely bamboo designs are the perfect way to stitch a hint of Asian flair onto your tote bags, quilts, pillows, and more. 6.90" x 10.58" and 5.87" x 9.02"
6.81" x 11.74" and 5.45" x 9.39"
4.50" x 7.79" and 3.97" x 6.86"
In China, bamboo is regarded as a representative for the model behavior for gentlemen due to it's uprightness, tenacity, and open heart. People endow bamboo with integrity, elegance, and plainness, and use those qualities to describe the perfect gentleman: mentally strong, upright, perseverant, and with an open heart. 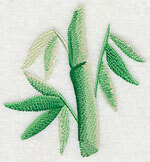 Stitch a bamboo border alongside the edges of pillowcases, on quilts, or on table linens to keep the qualities of this culturally rich motif prevalent in your home. 11.75" x 3.73" and 9.40" x 2.99" and 7.80" x 2.48" and 6.00" x 2.15"
A bamboo spray, corner, and single bamboo shoot are the perfect additions to this series of Asian-inspired designs. 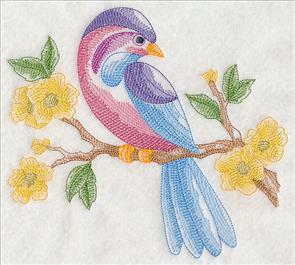 Stitch them all together on a quilt, a set of bath or bed linens, or on dining decor. 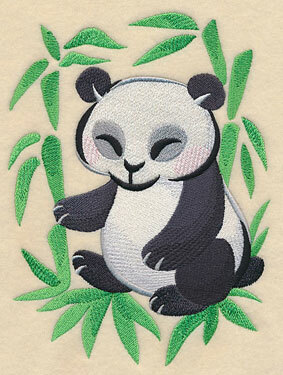 3.95" x 11.75" and 3.16" x 9.40"
5.86" x 6.25" and 4.86" x 5.18"
Stitch your favorite bamboo design alone, or purchase it in the pack to get all of the designs! 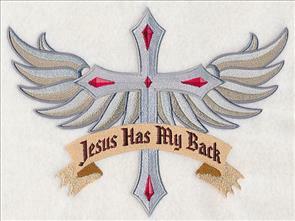 Linda and her granddaughters love our existing sweet and spiritual Jesus Has My Back design, and she has been stitching it on jackets for everyone since she bought it. She was hoping we could create a design to work for boys, too -- and we loved the idea so much, we created two versions! Thanks for the suggestion, Linda! 6.85" x 9.03" and 5.86" x 7.73" and 4.87" x 6.41"